More than likely the reason you have found my site is that you are trying to find your ancestors. After all, why would you search for a genealogy website if you didn’t want to know about your ancestors? In many years of undertaking research, I have ancestors I have found with no problem and then others who, no matter how hard I look, I am unable to find. This is part of the thrill of genealogy – trying to find the unfindable. You will find some ancestors just sitting there out in the open and others are tucked far away in a dark corner. Today I am going to step you through finding a birth record on a free genealogy search site. Where you initially search for a record depends on the locality of your ancestors and whether you are looking using free genealogy search engines or paid sites such as Ancestry and Findmypast. If you are using the paid sites and have an all-inclusive subscription you will be able to search multiple locations or countries from their site as opposed to free ones which are usually set up for one area. FreeBMD is for England and Wales records only. Also note that Civil Registrations of birth, marriages, and deaths only started in 1837 in England. This means any searches for births prior to this time will be in Church Parish records. FreeREG again is for England and Wales only. This is where paid sites make it easier as they can search multiple jurisdictions and multiple record types as opposed to these free sites. In Australia, each of the states has their own Birth, Marriage, and Death sites for searching. There are different websites and systems for Scotland, Ireland, the United States and other countries. Whilst it is possible to search the indexes for free in most localities, it is a case of finding the right website for that locality. That’s why projects such as FreeBMD, FreeREG, and FreeCEN, for England census, are so invaluable. Many volunteers worldwide are transcribing these indexes to help others access free searches in the future. One thing you should note is there can be errors in transcription so sometimes you might want to check another source to ensure the accuracy of the record. Also, if you didn’t find your ancestor previously you should try again as new people are added every day. You need to decide for yourself which way you want to go. I, personally use a combination of free and paid sites especially as sometimes one site has certain records that another site doesn’t. I know Findmypast has the 1939 Register and is currently the only site that does. Also, I can’t afford to have two subscriptions. What I tend to do is have a different subscription each year – that is one year I use Ancestry and the next year Findmypast. What I do personally prefer on Find My Past is the ability to access records you’ve previously accessed after your subscription is ended. With Ancestry if I don’t have a current subscription I cannot access the documents I previously looked at. Findmypast, however, keeps a record of documents I have seen before and allows me continued access even after my subscription has ended. So let us search for a record. I’m going to do a birth search for my grandmother Dorcas Stokes. So let’s go back to the first steps I told you about in Genealogy: An Introduction – write down what you know and what you can gather from older relatives. I know Dorcas was born in the late 1890’s to early 1900’s as dad remembers she was about 50 when she died in 1949 – he was 11 years old and remembers her death well. Dad remembers her maiden surname was Stokes and she was born in Staffordshire, England. 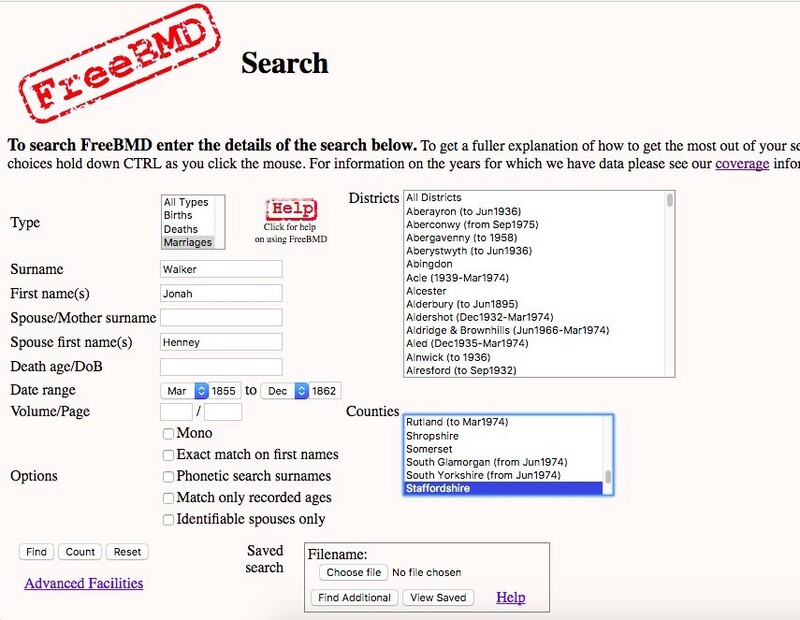 This is enough information for me to pick a site to undertake the search – in this instance, I’m going to use FreeBMD. Dec – covers October to December. So this result shows that in the whole of Staffordshire for the period Mar 1897 to Dec 1903 there was only one Dorcas Stokes born. There is no other Dorcas Stokes born in the entire of England and Wales from Mar Quarter 1897 to Dec Quarter 1903. I can be reasonably sure that this is my Grandmother. Just remember though that not every record has been coded yet. I do happen to know this is the correct record as I have other confirming evidence such as a birth certificate for her but for the purposes today it shows you how to do a search to try and find your ancestor. 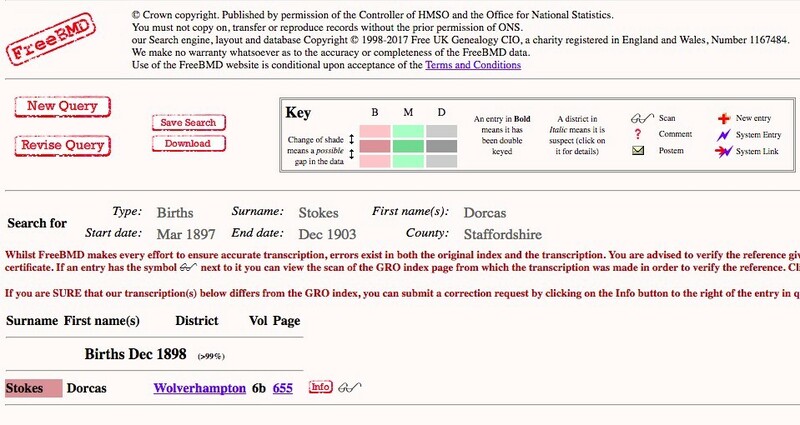 This is how you can undertake a search for any England or Wales birth, marriage or death – just change which record you are looking for in the search parameters and complete the fields you know. Sometimes no matter where you look – free or paid genealogy search engine, library, genealogical society – you can’t find your ancestor. Sometimes the name or year you have been given may be wrong. Maybe they changed their name or were called by their middle name all their life and no one knew this. Maybe it’s been transcribed incorrectly. And just maybe there is not be a record for them. Let’s put what we’ve learned into practice. Over the years I have had some very hard to find family members. One of those was Henney. I knew she existed – besides the fact my family exists – because I had records of her in the England Census of 1861. She was married to my second great-grandfather Jonah Walker and at that time they had two children – Sarah and George. However, come the 1871 England Census she was gone, as were both Sarah and George but Catherine and Aaron were living with Jonah. He was now a widow and boarding in a house with the two children. What had happened to Henney? More importantly who was Henney to start with? In this case, I would start with marriage records as I had no idea of her birth name. I have set the parameters as Mar 1855 to Dec 1862 as from the Census I know that Sarah was born about 1858. I’ve put Staffordshire as the census has them living there and having been born there. The result is nothing! So back to the parameters again. I’ve removed Henney’s name and Staffordshire. The results – two Jonah Walker’s married in 1857. As one of these Jonah’s is from Wolverhampton, a district in Staffordshire, I will click on that record. Clicking on the page number I will get a listing of all the people married in Wolverhampton in the March Quarter 1857. On this page, you will usually have a number of names listed. This being a marriage index it would normally show an equal number of males and females. It is then you can establish who your people are. In this case, I only have two males – very unusual. At the time I originally found this I thought it was a bit odd as there were two males and no females listed. I thought it was possible that Henney had been miscoded as Henry. I decided to order the marriage certificate from GRO (General Register Office) in England to test this theory. I ordered the certificate using the above information, however only put in Jonah’s name. The other required information was District: Wolverhampton, Volume: 6b, Page: 543 – this is all that is required to order the certificate you need. When I received the certificate it confirmed what I thought, Henry Foster was indeed Henney Foster – a coding error had nearly had me overlook this record. I am still on the hunt for Henney’s death record. I have searched all the above sites but to no avail. It is highly likely that she has been incorrectly coded as Henry again, however in the timeframe, she is most likely to have died there are a number of Henry’s. One day, when I have enough money, I will take the risk and order a certificate in the hopes I pick the right one. It isn’t always as easy to pick up an error as my above example, but as you can see it does occur. In genealogy, you often have to think outside the box to find an elusive ancestor. Start searching for your elusive ancestors today by clicking on the image below. Great post! I love finding out more about my family and where they came from. It’s so interesting to see what countries they came from and how my family got to where they are now. I found your post very helpful. I wanted to know more about free sites and the sites that charge. I like the idea of using a combination of free and paid sites because I can’t afford more than one subscription either. Thank you Weston. It is a case of learning what sites are on offer out there. It is important to remember that whilst you can get some information on free sites, if you are wanting to see scans of original documents you do need to pay whether that is as a subscription or ordering a certificate. I always have a file going with information I want to check on a paid site when I have a subscription. Please feel free to ask questions if you need direction in your research. This is a very good post! You have given great detail and examples on finding ancestors. I recently signed up on Ancesry and am beginning my family tree. I have sent in my DNA and am waiting for the report. I will be. 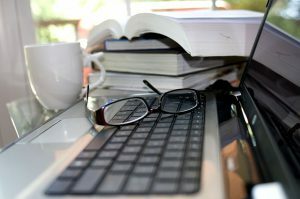 bookmarking your website so I can refer to your helpful advice when I am ready to start! Do you think Ancestry is a good place to get all the information I will need? Glad you enjoyed it Dave. I hope you enjoy your adventures into your ancestry as much as I have over the years. Ancestry.com is a great way to research your ancestors as they have billions of records. Unfortunately they do not have access to everything available but they are certainly a very, very useful resource for any genealogist regardless of their experience level. Please don’t hesitate to contact me if you have any questions. Love going back to basics! Sometimes that’s all we need! Sure is Helen. I sometimes go back to basics just to make sure I do have the correct people connected to my tree too. Wow, I really appreciate your dedication and persistence and then sharing with us how you’ve tracked these folks down. Seems much more doable now! It is such a learning curve to trace your family and persistence is definitely a must especially for the elusive relatives! If you take it step-by-step and plan out how you will approach things you will be able to discover amazing things. It would be very overwhelming. I have a friend who didn’t know she was adopted until about 7 years ago when both her adoptive parents had died. A family member then told her and she eventually found her biological family – the reunion went brilliantly – and she has another big circle of family and feels so blessed. However, she was anxious and nervous at first so I can imagine how you fee. It is funny how names come around in the family, sometimes without even planning it! My mum’s middle name and her step-sisters first name are the same! Anyway, any assistance you need feel free to contact me. I am so glad you have found information here that is helpful to your research. Please don’t hesitate to contact me if you need some help. After reading what you went through to find Henney, I thought the possibility might work. I seem to have hit a brick wall. The reason we can only go back to our great-grandfather appears to be that there was someone in the family who was possibly a felon and change their name and. The family never speaks of this and it turns out that I am beginning to be the oldest of my family. The members of the family that may be all that and I are minuscule and we have spread to the corners of the United States and we are not in touch with each other. What does one do now? It is hard to track down the people who changed their names as there weren’t the regulations in place that we have today. You could disappear and reappear in a new town, with a new name and nobody would be any the wiser. Do you have contact details about the family members scattered around the country? Do you know roughly where they are to find them? I used the internet to hunt down my dad’s great-nieces and nephew and finally found them on Facebook – I was lucky they were all friends on each others pages so it was confirmation I had the right people. Place notices on online forums such as Roots Chat where you can ask for information regarding particular surnames or looking for ancestors of a particular person. Good luck – come back and let me know how you go!